Transactions Ping Post Report shows information about Ping Post transactions between API publishers and PX. This report is used to quickly find the data about leads sent from publishers to PX, including dates, ID’s of transactions, publishers and their subs, transaction payouts, lead prices, other information about sold leads or error messages explaining why leads were not sold. Transactions Ping Post Report helps to determine what exactly happens to the lead after it is posted to PX. To view this report, go to Reports -> Transactions Ping Post Report. Transactions Ping Post spreadsheet can be sorted by columns. Click any column heading to sort the spreadsheet down, click one more time to sort it up. 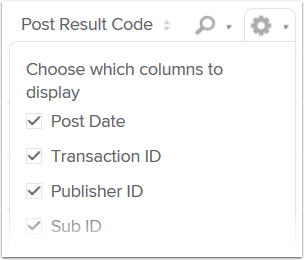 You can also select columns to display, depending on information you need. To modify the spreadsheet, click the gear icon in the upper right corner and select necessary checkboxes. 1. Post Date is the date of the transaction. 2. 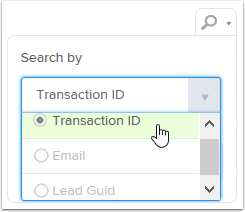 Transaction ID is a unique ID of the transaction generated for the incoming lead when it gets into PX, or sent in the lead's information. 3. Publisher ID is a unique ID of the publisher that sent the lead. 4. Sub ID is a tracking parameter, which reflects зublisher in different verticals and shows where the publisher's traffic comes from. 5. Vertical is a lead generation niche, in which the lead was submitted by the publisher. 6. Payout is a PX bid sent to the publisher for a corresponding lead. It is calculated as the product of Lead Price and publisher’s Margin (configured in publisher settings). Payouts may be different on Ping and Post in case the lead was not sold or if Correction bid type was used. 7. Lead Price shows the internal price calculated in PX according to the information provided in the ping and PX statistics. Click the value in the column to see Ping Calculation pop-up. 8. Transaction Duration shows the time spent on processing the request. 9. Email shows the email address sent in the request (if there was any). 10. Post Type shows the type of the request (PING or POST). 11. Buyer Result shows Success status of the lead sale or the reason why it was not accepted by PX. 12. Lead Guid shows internal unique ID of the lead generated in PX platform. 13. Expected Legs - the number of legs found on Ping (if no legs found or lead is exclusive - 0 is displayed). You can also view Lead Transaction ID, Payout, Lead Price and Min Price calculated for this lead. There are also two tabs showing winning and eligible campaigns. Transactions Ping Post report can be filtered by date, by Publisher, by Buyer Result, by Post Type, and by Vertical. 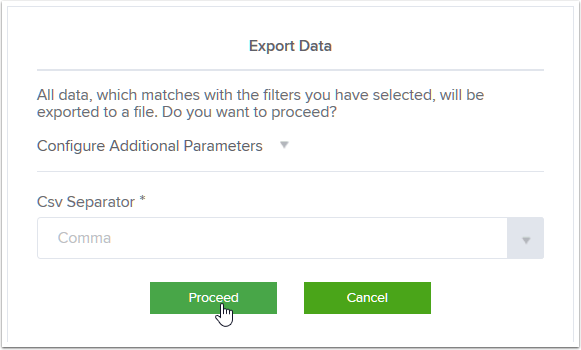 All filters include the option of multiple selection. You will receive the notification as soon as the report is ready for download. To download the report, go to Reports -> Export Downloads.